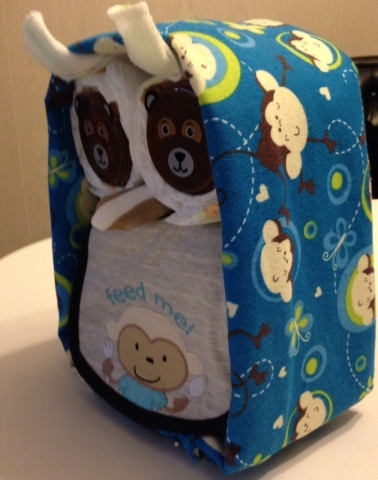 Diaper Cake includes a soft handmade flannel blanket 35" x 41" with folded hem edge to ensure years of use, 26 Size 2 diapers (14 - 18 lbs. which show a blue line when wet), 2 snack cups with spoon, a baby washcloth, a BPA free baby bottle and a baby bib. It is 10-1/2 inches tall and 9 inches wide. Everything is new but taken out of original packaging. It makes a statement as a shower gift, centerpiece or new baby gift. Patterns of materials will vary due to availability. Selection is Designer's Choice. Customization is an additional charge. She will love it! Shipping will be $40 and up (depending on the zip code where it is being mailed to, weight and mailing box size) not the $7.50 that prints out in cart. This is also available for local pickup in Phoenix, Arizona.